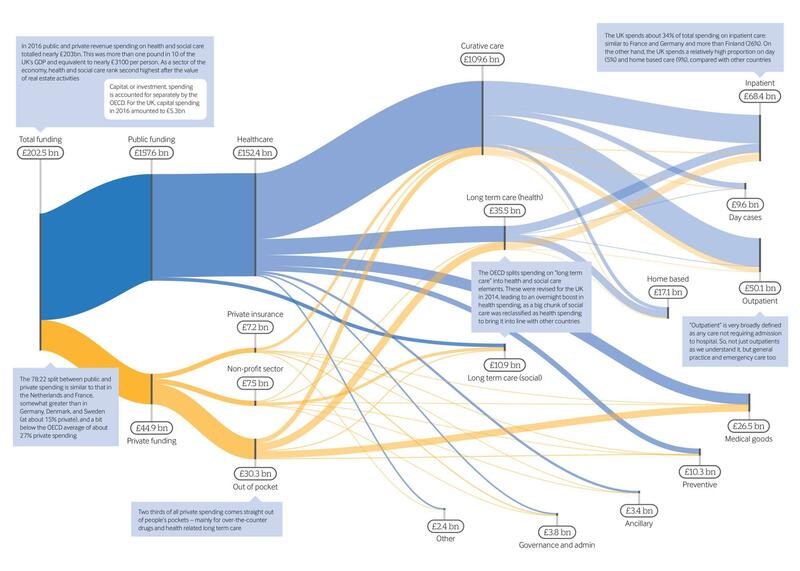 The Organisation for Economic Co-operation and Development’s 2011 system of health accounts, revised in 2017, is a Herculean effort to try to impose some international order on the way member countries report their spending on health and care.1 Although it is impossible to obtain completely comparable data across countries, given differences in funding systems and organisation, the new accounts now drill down to reveal more information about what countries spend their money on. 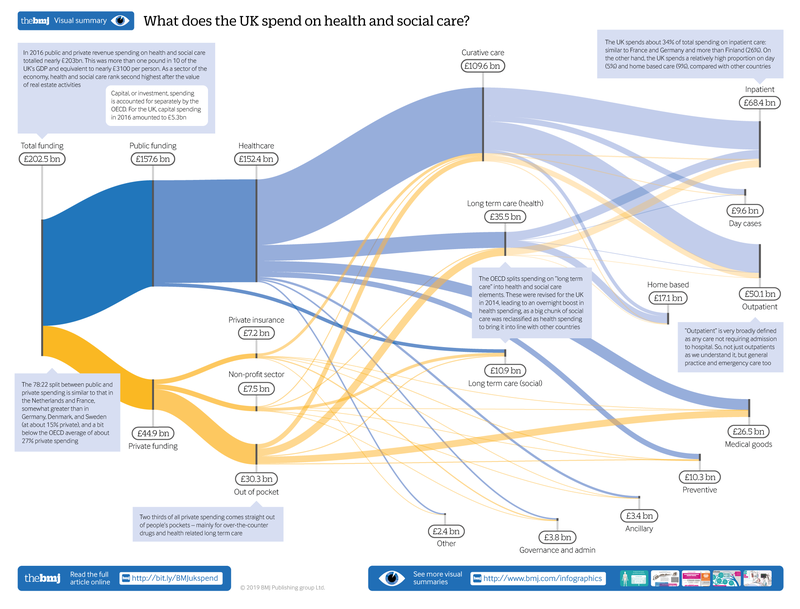 The UK’s spending on health and social care (a grand total of nearly £208bn—including £5.3bn of capital spending) comes from two main sources, public (£157.6bn) and private (£44.9bn), and eventually flows through to various types of care: inpatient care, home based care, prevention, and medical goods, for example (fig 1). These sorts of spending data alone cannot answer the sort of policy questions countries may grapple with: for example, are we spending too much or too little on secondary care versus preventive services? But as trends start to emerge from these new datasets, countries should be more able to supply data at more detailed levels of spending. And, importantly, as spending is linked to health outcomes, health and care services will be better able to assess the effectiveness of spending, given the allocative decisions they make. Organisation for Economic Co-operation and Development. A system of health accounts. 2011. www.oecd.org/publications/a-system-of-health-accounts-2011-9789264270985-en.htm. You are going to email the following What does the UK spend on health and social care?